The highest point in the World, is Mount Everest (8,848 m), situated in the Tibetan region of the Himalayas. 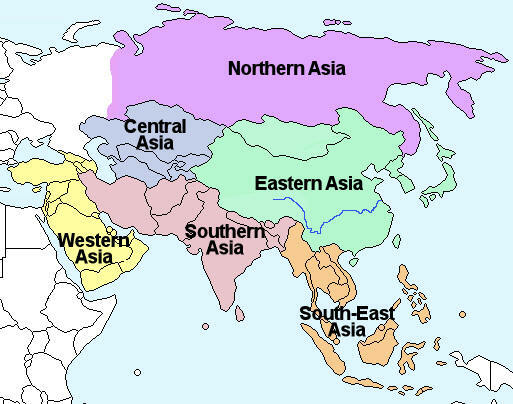 Asia is broadly divided into six regions as shown on the map right. 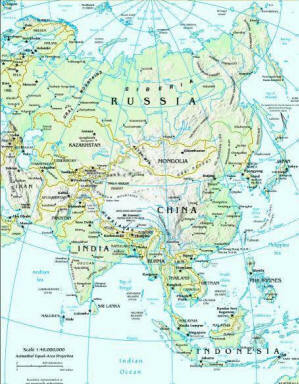 Asia lies almost entirely in the northern hemisphere and the seasons of all are similar. The seasons of southern and south-east Asia vary slightly because of the monsoons. There are 53 countries in Asia including Russia and Turkey which lie in both Europe and Asia and Taiwan which is technically a part of China and not officially recognised as a country by the United Nations. Asia is the most populated continent containing around 60% of the World’s population. The population of Asia is growing with a growth rate of approximately 2%. The total population of Asia is approximately 3,879,000,000 (2005). Eastern, southern and south-east Asia are the most populated while the desert, mountain and tundra regions are the least populated. China, India and Japan are the most economically developed countries. The large oil producing nations – Iran, Iraq, Kuwait, Qatar, Saudi Arabia and the United Arab Emirates are also in Asia. Economic growth in Asia has improved living standards for millions of people, but there remains a huge poverty problem and the gap between rich and poor is growing. According to World data records around 60% of the world’s poorest people live in Asia. The plant life of Asia is wide and varied and differs according to climatic region. Due to the cold during the winter months, only short grasses and shrubs can survive in the tundra and alpine/mountain regions. 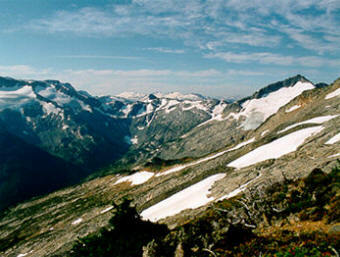 The picture (left) shows an alpine/mountain region. The desert regions are home to those plants that can survive the arid conditions like cactii. The animal life of Asia is wide and varied depending on the climatic region. The tundra is home to reindeer, foxes and wolves, while camels and lizards can be found in the desert region. 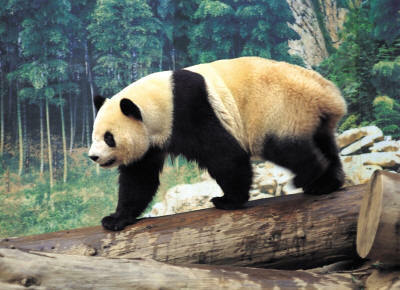 Bears can be found in the coniferous forest region while the mountainous region of China is home to the giant panda.